Pension Form A certifies the work you have done at a given practice (for OOH work you complete a SOLO form). Form A has two parts. The first part is completed by the locum and details the sessions worked and the fees earned. You should submit a Pension Form A with every invoice to the practice. The practice then completes their part of the form, signing and stamping it to confirm to the pensions office that you have undertaken the pensionable work. They return the form to you. Every month you will send all your Form As to the pensions office with a Form B and your pension payments for that month. Pension Form B only needs to be completed once a month. It is a summary of all the pensionable pay that you have received from practices in that month. It is created based on the date the work was paid, rather than when the work was done. For example, if you work at a practice in June and get paid for this work in July, you will create a Pension Form B for the June work in the month of July. It gives you a final figure of your contribution to the NHS pension scheme. At the end of each month you should collect all the Form As you have received back from your practices. Then prepare a Form B to record the payments on the form A's you have collected in that month and calculate the total pension contribution required. 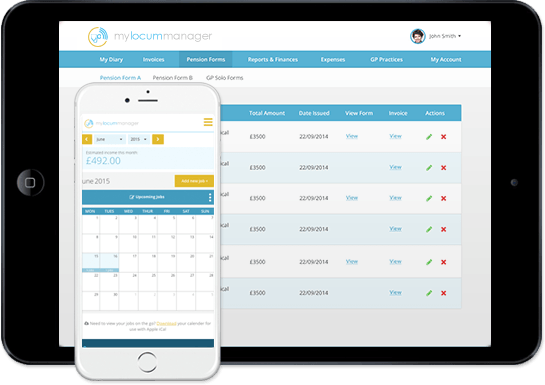 MyLocumManager does this automatically for you in one click!In England and Wales, this total is made up of the employee and employer contributions. In Scotland and Northern Ireland, the form will calculate only the employee contributions. Send all your Form As with the corresponding Form B together with a cheque of your pension contribution amount to the pensions office. Cheques are made payable to NHS England. In England, you can also make contribution payments via BACS. You must send your pension forms and contribution payments within 10 weeks of the date worked or before the 7th of the next month. Where do I send my forms and payments? The quickest and easiest way to pay your contributions is by BACS. When submitting your Pension Forms A and B you must submit a copy of your BACS submission, confirming the date of payment and amount paid. Details of how to make BACS payments can be found on the Primary Care Support England website. If you require any further information, contact the Pensions Section, Primary Care Support England, Preston Office by e-mail pcse.pensionspreston@nhs.net or telephone 01772 221444. Make your cheques payable to your Local Health Board and send your forms and cheque to them. Useful addresses can be found here. Make cheques payable to NHS National Services Scotland. Send everything to the relevant office in your area. How can I track my pension contributions? For those working in England and Wales, you can apply to view your Total Reward Statement online, which will tell you how much you have contributed towards your pension.